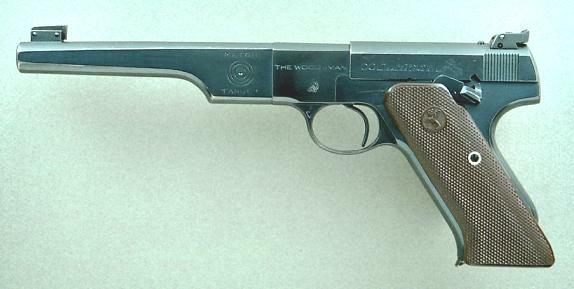 This is one of approximately 4000 Match Target Woodsmans that Colt made for the US military during WWII. All correct, with the Crossed Cannons ordnance wheel on the left side and the initials of the government inspector, GHD, on the right. Extended plastic grips are correct for the military guns. Factory letter indicates shipment to the Navy supply depot. Exceptional condition for a military gun!